on one live Magento host. Offer many products with special price and provide a lot of discounts during the sales period? Make your customers search among discounted products hands down in the product catalog. With Discount Filter you can choose between different slider views or even show particular discount ranges. To show customers how much money they can save, select the most favorable way of discount value displaying in ‘Amount’ or in ‘Percentage’. Embed the discount filter to Layered Navigation. Show the discount filter as a price range or as a slider. Let customers set discount ranges using the slider. Enable auto price range intervals or set them manually. Display discounts in percentage or amount. Choose discount rounding type: integer, tenths, or hundredths. Support all types of products. Have a lot of discounts and special prices but wondering why there are not so many purchases? Want to make sales periods more profitable? With the ‘Discount Filter’ extension you let customers find the best special offers in a moment in each product category. 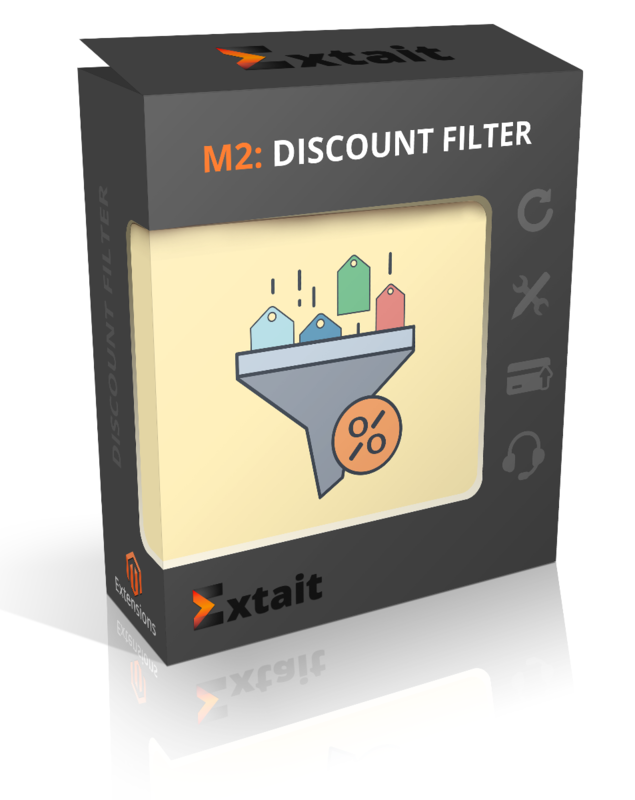 Moreover, discount filter will be a beneficial option for your customers as now they can easily navigate among promotions. Extend Layered Navigation with discount filter and see how your sales achieve new heights. Easily add the discount filter to the Layered Navigation panel. Enable the module and proceed with other specific settings for filter displaying to meet your requirements. Select one of three views of the discount filter. It’s possible to display it as a price range with customized intervals or as a slider which also has two additional settings. Consider how it would be better for your customers to search through discounts. Select the slider: with one starting point ‘From’ or with two starting and ending points ‘From’ and ‘To’. Set the ending point of a slider. Display it up to 100% or up to the maximum discount in the product category. If there is no matching search results, the message appears to inform about it. Allow customers indicate the starting and ending points of the discount range or set just the initial marker. It’s possible to move the slider position or type the exact value in the boxes below. After the setting, click ‘Apply’ to see search results. If you select ‘Price Range’ view, configure the way of intervals calculation. Enter the number of intervals and the extension divides discount into equal value groups. If they configured manually, specify the amount from which each interval begins. Choose the most convenient way to display discounts in ‘Amount’ or ‘Percentage’ for search. So, on the front-end the correspondent symbol of either the currency or percent is used. Consider the way to display discount value: more precise or approximate. Round up them to integer, tenths, or hundredths. You can apply this for both ‘Amount’ and ‘Percentage’ options.